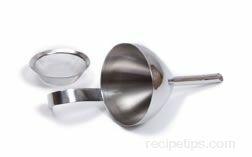 A kitchen utensil that is used to pour liquids and small-grained ingredients from one source into another. 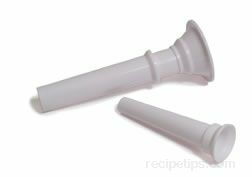 Funnels have large open tops that slope down and decrease in size forming a small diameter outlet allowing placement into smaller areas. The outlet may have a filter plate that strains some of the larger components not desired in the ingredients of a sauce or ground materials that are being transferred. 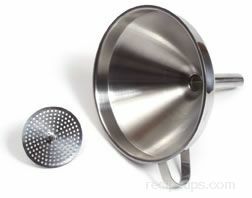 Funnels are available in a variety of materials ranging from plastic to stainless steel.